Thank you again for a record breaking Havana Nights Gala! Please review and pay your balances due on Givesmart. If you have questions or would like to pay via check, please contact us ASAP at seeyouinhavana@sigala19.org. If you purchased items on the silent or live auction, they need to be collected as soon as possible. All remaining items are in the school office until next Tuesday March 26, 2019. Please collect your purchases or they will be re-donated in your name to the next SI fundraiser. 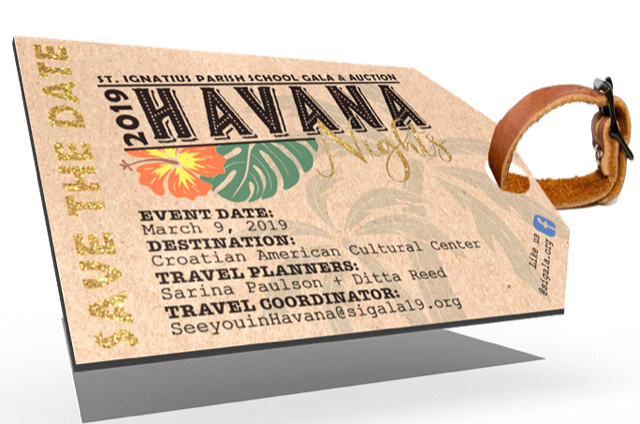 The SI Parent Club would like to give a big THANK YOU to our co-chairs of our 2019 Havana Nights Gala & Auction …Sarina Paulson and Ditta Reed! What a fabulous evening they created for our community! And to all the volunteers who helped in putting all the pieces together from planning to execution, we THANK YOU! The Parent Club would also like to extend sincere appreciation to our generous sponsors and supporters! Thanks to all of you we “blew the roof off” Havana!!! As part of the Gala season, we took individual black & white photos of our students. If you were unable to purchase them at the event, or did not attend the Gala and would like to purchase, please stop by the Gala table at pickup, Monday-Wednesday this week (2:30-3:30p). Individual photos are $25 & 2 or more $40. If you purchased your photos at the Gala they will be sent home this week. Thank you for your support. Final Chance For Some AMAZING DEALS!!!!! There are a few items that did not sell on silent auction this weekened so we have lowered the prices. Take one more peak at www.sigala19.org to see the great deals on these items. These are buy it now items so the first to click & buy gets to take them home!!! Thank you for an incredible Havana Nights Gala! We are so grateful for the amazing contributions from donors, volunteers, grandparents and our kids!! Thank you for your support. Please review and pay your balances due on Givesmart by following the link via email or text. If you have questions or would like to pay via check, please contact us ASAP at seeyouinhavana@sigala19.org.